I didn’t start this blog so that I could become some sort of mean mystery-shopper who delights in anonymously slating Dublin restaurants. They’re having a hard enough time of it as it is. Chances are, I’m only going to decide to spend my precious time and cash somewhere that I’m pretty sure will be good based on others’ recommendations, or am curious enough to check out and find something at least constructive to say. So, this is all a rather roundabout way of leading into “another” glowing review. But believe me, it’s deserved, as those of you who have visited this place will know already. A couple of weeks ago I was entertaining my sister for the weekend, and was looking for a Saturday early bird deal that we could avail of before heading to a gig that night. Their brilliant value early bird menu was a perfect opportunity to try out the Whitefriar Grill, a place that I’d been hearing a subtle, mostly brunch-related buzz about for a while. They do 2 courses for €18.50 or 3 for €21.50, which knocks the socks off most rivals in terms of price, and also offers a more generous time slot (5-7pm) on a Saturday than you’ll find elsewhere. 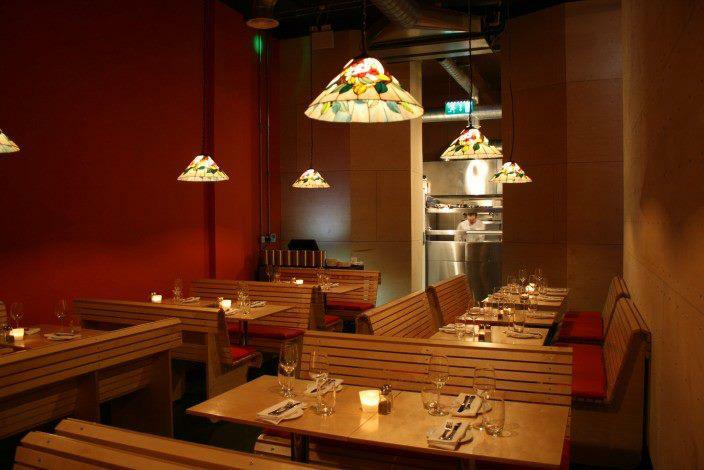 A serendipitously positive review from Catherine Cleary in the Times on the day we visited was enough to reassure our third dining companion – let’s call her the D4 Die-Hard – who would otherwise have wondered why on earth you would go to Aungier Street for dinner on a Saturday night. We took our table at 6.30, and loved the simple but cosy candlelit surroundings which I’m guessing work equally well by day or by night. We ordered a bottle of ‘The Stables’ Marlborough Sauvignon Blanc (€30) and browsed the choices on the early bird menu. Having heard that these guys are all about their meat (I guess the clue’s in the ‘Grill’ bit), I went meaty for my starter and chose the Jack McCarthy’s black pudding with oxtail and fried quail’s egg. 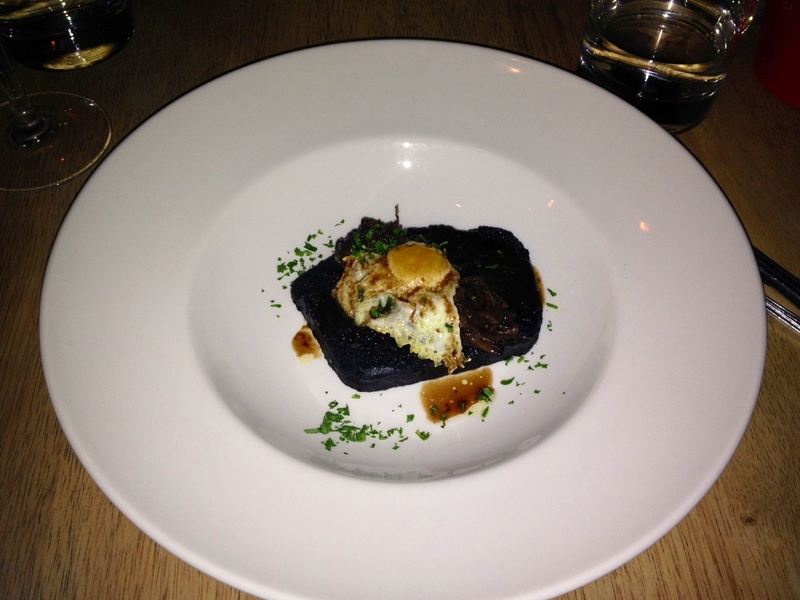 Black pudding starter with oxtail and quail egg. This was an outrageously flavoursome dish and I found myself eating it in tiny bites to make it last as long as possible. 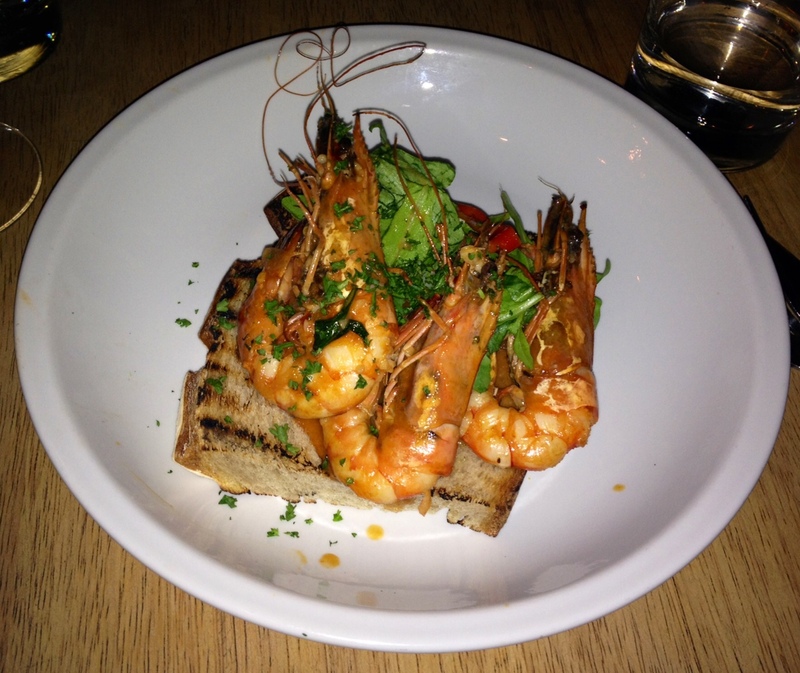 My D4 Die-Hard had the gambas pil-pil on crushed tomato toast, a large portion with some truly giant prawns on top of toasted, tomato-ey sourdough bread. My sister’s salad of saffron-poached pear, gorgonzola and raspberry vinaigrette looked slightly inferior in comparison to the other two mightily meaty starters, but was a perfectly tasty option in its own right. You’ll be glad to know that my steak craving is on temporary hiatus, so I opted for roast fillet of hake which arrived beautifully crispy, presented atop a plank (more food on wooden boards!) and accompanied by new potatoes, peperonata and fine beans. It was a generous portion of fish and I found myself disagreeing wholeheartedly with the criticism in the Irish Times review that the hake they’d had was dry, as mine was succulent and tasty, a view shared by my sister who was stealing from my plate/plank in between bites of her own tandoori chicken (with Bombay potatoes and mint yoghurt). Full of good cheer (and halfway through a second bottle of wine), we all decided to go for dessert and I had a Bailey’s and cherry creme brulee, which was presented in a simple ramekin dish – perfectly hard and crunchy on top, creamy and cool underneath, with just the right amount of Bailey’s flavour running through it. The other two were getting stuck into some excellent chocolate fudge brownies – a staple dish on many menus but here, artfully stacked on the plate along with ice-cream and cream. The corner I nicked from across the table tasted very good indeed. So, the damage. Three early birds, two bottles of wine, and a couple of coffees set us back just over €40 each. I could happily have stayed ensconsced in the back of the Whitefriar all night, but the downside of the early bird option is that the next round of paying punters are snapping at your heels by 8pm. 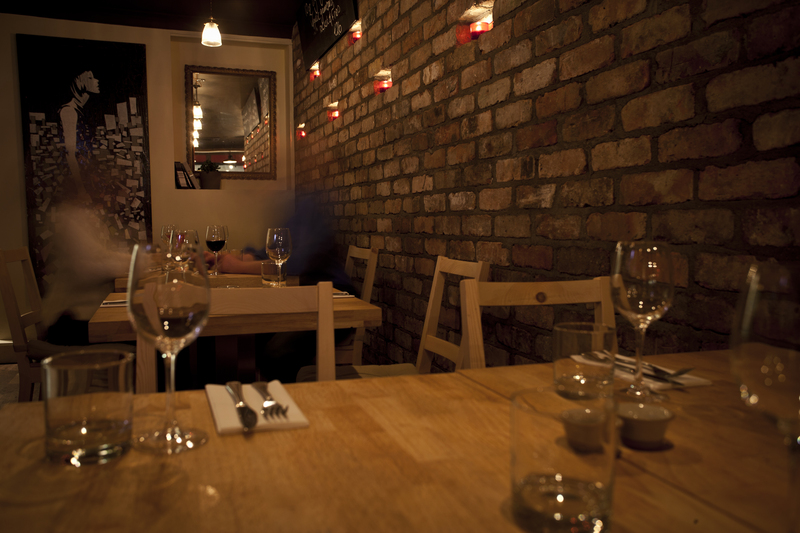 So it was time to move on, back out into the chilly Aungier Street air, and ready for our night out to begin. I’ve already been back for brunch once since then (there’s only one word for their Pork Belly Florentine and that word is ‘OMFG’), and have also booked a big table in for our Christmas LLLL,* when we will be very much looking forward to trying out the cocktail menu. So sorry, no slatings here just yet. *Lovely Ladies’ Liquid Lunch (TM). Sip & Slurp, Charlemont Street. Photo credit: Sip & Slurp on Twitter. Sip & Slurp is a cute new cafe that’s bringing a home-cooked flair with a hint of cool to a bleak enough location, across from the flats on Charlemont Street (it’s around the corner from the Harcourt Street Luas stop, and within 5-10 minutes walk from both Ranelagh and Rathmines). I took a seat at a bench and had a look around while I waited. It’s a high-ceilinged echo-y space which has clearly been fitted out on a budget, but has some nice design touches too – such as the bench seating, soup cauldrons with hand-written labels (the soups are a big focus here), and the cafe logo stencilled on the wall. I’d heard that the cafe has been started up by a few friends in their 20’s, which would explain the super-friendly attentive people behind the counter and checking in with customers on the floor. There was also a seriously tempting display of baked goodies including scones, caramel squares, banana chocolate cupcakes and home-made granola. You can combine a soup and a sambo for between €6.90 and €7.50, which I spotted being delivered to tables on wooden boards. What is it about wooden boards replacing plates in Dublin restaurants these days? Anyway…again, a really well-priced, hearty lunch option compared to the coffee chains. No doubt Sip & Slurp is hoping to benefit from the nearby Harcourt Street coffee and lunchtime office trade. A promotion earlier this week on Twitter offered all coffees for just €1 and was cleverly tweeted @ all the nearby offices and businesses (they’re @sipandslurp on Twitter, by the way). My chicken salad was zingy, with plenty of chicken, coriander, peppers and chili, maybe lacking a definitively Vietnamese flavour which could be sorted with a few cashew nuts or nuoc cham dressing perhaps (I’d choose these extras over the 2 slices of bread which came on the side), but for €4.90 it was fresh, healthy and filling. My flat white was creamy perfection, clearly made with TLC by someone who knows their coffee. I enjoyed it so much that I ordered another to take out as I was leaving, ensuring an over-excited bounce in my step for the rest of the day. 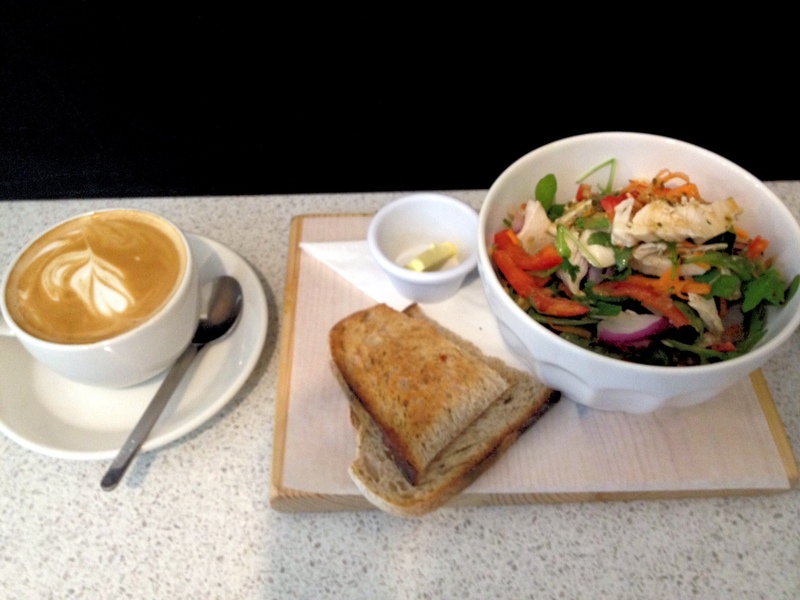 Flat white & Vietnamese chicken salad. So if you’re working or living in the area, pop in for a coffee or a sambo and give these guys your support. I’ll be strolling down some weekend soon to try the brunch menu, once that’s up and running. 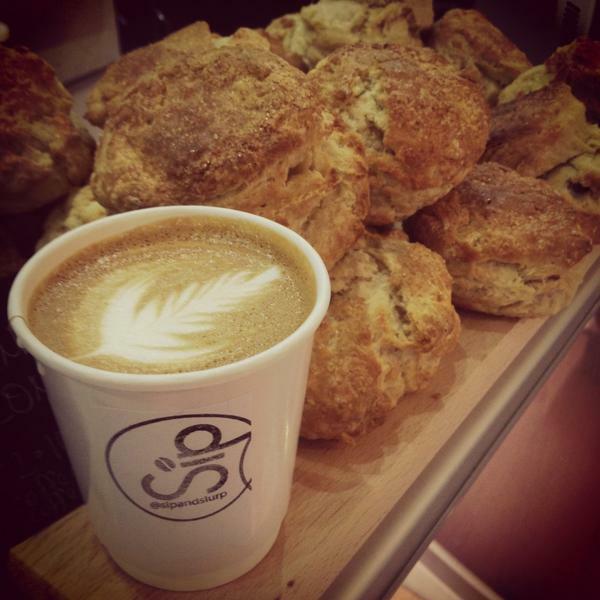 Sip & Slurp, 67 Charlemont St., Dublin 2. San Lorenzo’s, South Great George’s Street. So maybe it’s the wintry chill in the air, maybe it’s the type of eateries I’ve been frequenting the last few weeks, or maybe I’m just a savage…but on my last few dining excursions, all I’ve been interested in is red meat. I must have been on a roll after my tasty steak at Salt in Monkstown, as I then followed my carnivorous nose to Chez Max, Bear, and finally San Lorenzo’s on George’s Street all in the same fortnight (don’t judge me). San Lorenzo’s was the venue for a Saturday night catch-up with two of the girls, and we were really excited about our first visit there. After I’d called to book our table, I’d had a friendly call-back from Gerry, the restaurant manager, to explain that their set-up for tables of three was to group us at the end of a bench which he described as “cosy but our customers really like it.” The Americans would call this “managing my expectations” and it was a clever, professional gesture that ensured I didn’t complain on the night, as I navigated my way into a definitely very tight corner, in a fashion not befitting an almost-as-tight frock. Once settled, I was handed a copy of i:D to flick through and tempted into a “cheeky gin & tonic” by Gerry as I waited for the others to arrive, a man who clearly knows a rubber arm when he sees one. At 8pm on a Saturday, the place was buzzing with a mix of other diners – a well-heeled table who wouldn’t have been out of place in Town Bar & Grill circa 2007, a group of lads in their thirties out for dinner, a very young couple on a date beside us (awww) and a range of couples of varying ages. San Lorenzo’s, as many of you have probably spotted by now, took over the old Juice premises on George’s Street when it opened last year. The high ceiling is still the most noticeable feature of the space, but the rest has been warmed up by filling it with wood & red leather benches, with one wall painted a dark red, and the other a bare wooden finish. I know it’s meant as NYC-stylish, but after a few hours facing the ‘red wall’, I still wasn’t quite sure how I felt about the decor. However, I was too full of food at that stage to care. What I did love about the interior here, were the loos. A steep climb upstairs (try it after a bottle of wine) brings you to yet more wooden walls, three unisex cubicles and a huge interior window… through which you can look right down into the kitchen at the food being cooked, while you wash your hands. Finally an excuse for spending too long in the bathroom. We loved our American waiter, who expertly advised on the menu then indulged us as we all sheepishly ordered rib-eye, and helped us navigate the dessert menu afterwards. The staff here are all fantastic – individual, friendly and so obviously experienced. The rib-eyes were perfectly cooked to our three different preferences, drenched in garlic butter, and topped with sprouting broccoli, on a circular bed of sage & mustard mash. There was no “Oh I wish I’d had the scallops/rabbit special/salt-marsh duck breast” out of me once they arrived to the table, as we devoured them in what felt like minutes. 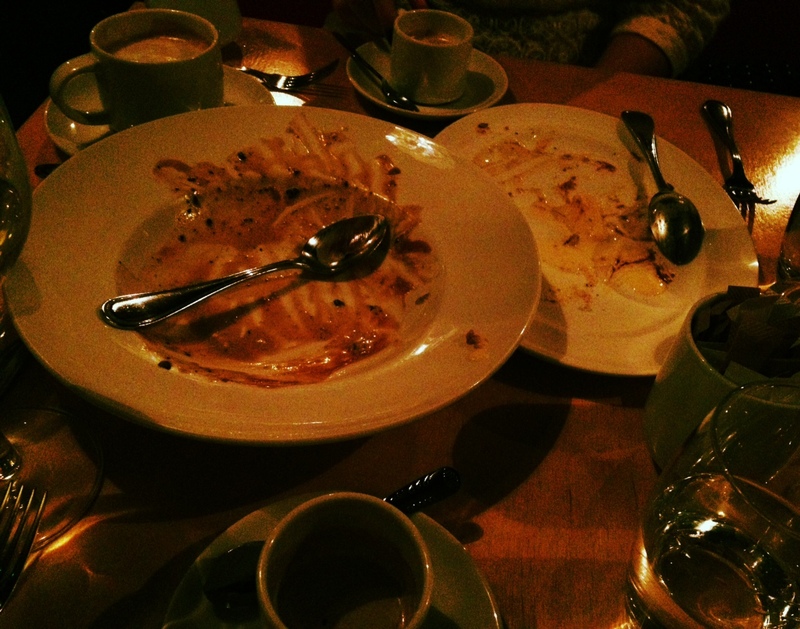 Not having had starters (you have to love the female logic), we went for two desserts, three spoons and some espressos. 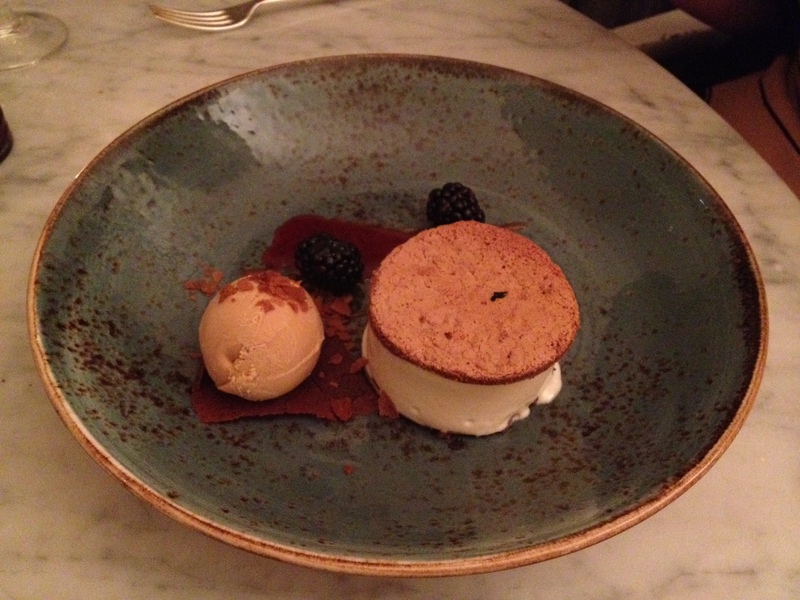 The house Tiramisu, a treat you’d surely expect to see on an Italian-American influenced menu, and a Nigella-esque baked Nutella cheesecake, were both lick-the-plate divine. We were surprised to notice that it was after 11 when we asked for the bill – now you might put this down to the ability of three women who haven’t seen each other for months to turn hours into mere minutes simply by yakking their heads off, but I put it down to the lovely staff who put us under no pressure at all to move on. Three steaks, the desserts, coffees, a mid-priced bottle of wine (and of course my cheeky gin & tonic) set us back just over 50 euro each. I resolved to try their great-value early bird in the next few weeks to expand my knowledge of the menu beyond the steak part – it gives a great choice at 22.50 for two courses or 27.50 for three, all night Sunday, Monday and Tuesday and between 5.30 and 6-45 every other evening. Highly recommended. My only tip is that, if you’re a party of three, find a fourth partner in crime. It’ll give you that bit more space to accommodate your full bellies after you’ve enjoyed Temple Garner’s fine food. San Lorenzo’s, Sth. Great George’s St., Dublin 2. Peanut butter & macadamia ‘Iceberger’ at Salt. I had one of the tastiest steaks I’ve had in ages at Salt in Monkstown this week. Billed as “Dry-aged sirloin steak with Jerusalem artichoke puree, Lyonnaise potato & cavolo nero,” this sirloin wasn’t cheap at 24.95 but it was huge, beautifully charred (if maybe a little more medium than the medium-rare requested) and served on the most delicious little pile of cavolo nero, aka. “cabbage disguised as tasty vegetable.” I passed on the Lyonnaise spuds and instead substituted it with a side order of their broccoli with chilli and garlic, without any hesitation from the waiter. On seeing this fine hunk of meat (the steak, not the waiter), my “not drinking on a Wednesday” resolution went straight out the window and I ordered a glass of Montepulciano to do it justice. I was there with three old schoolfriends on one of our increasingly-suburban-based midweek meetups, and between all four of us we also got to sample two other excellent main courses: Linguine with gamba prawns, prawn bisque, chili, garlic and green beans @ 17.95; and a food-envy-inducing Wicklow venison loin with Savoy cabbage, fondant potato and butternut squash puree (I’m going back for this), which was unbelievably tender, rare and full of flavour. All were delivered to the table with friendly flair and we had some great banter with the staff throughout our meal. Although stuffed full of steak, venison and pasta, all talk of diets (which really should have no place at a dinner table anyway) went out the window when the cute little dessert menus were craftily placed at our elbows, and we proceeded to share a ‘Peanut butter and macadamia iceberger’ at one side of the table, and a ‘Mango & passionfruit parfait with coconut panna cotta’ over on the other. I tend to see dessert as a waste of calories unless it contains chocolate or nuts, but I had to admit the coconut panna cotta was amazing both in taste and texture – like a smooth, wobbly, middle of a Bounty bar. And the peanut butter iceberger was ridiculously good, consisting of a scoop of peanut butter ice-cream surrounded by shards of brittle, and an ‘Iceberger’ totally elevated from the HB version of our childhoods. All desserts are 7.50. We continued our chats after dinner until long after any other diners had left, without any rush being put on us by the wait staff, which we really appreciated. Without alcohol, other than a single glass of wine, the bill came to about 30 euro each, which we felt was a fair price for a mid-week treat in such lovely surroundings. I’ll be going back for dinner, instead of doing battle with the buggies for brunch, from now on. Avoca Foodmarket & Salt Cafe, The Crescent, Monkstown, Co. Dublin.